In pigs, Ascaris is the most common parasite in Europe with a prevalence of more than 30%. 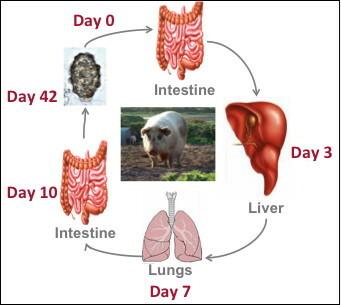 Pigs with ascariosis have lesions in liver and lungs, the latter causing a predisposition to viral and bacterial infections. Ascariosis is traditionally being controlled by mass therapy with anthelmintics. Despite the high efficacy of these products, the long-term effect of the anthelmintics is disappointing and the problem with ascariosis is actually increasing. The most important reason for this is the prodigious fecundity of Ascaris (a female worm can produce up to 800.000 eggs/day) and the ability of eggs to survive for long periods of time in the environment. This results in a high environmental contamination and rapid reinfection. Only vaccination could in our opinion result in a long term, efficient control. However, in order to make informed decisions regarding the appropriate vaccine antigens and the mode of delivery, more knowledge is needed on the molecular biology of this parasite and the natural immune responses induced. 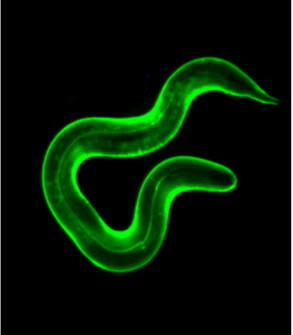 The development of a protective immune response after exposure proves that vaccination against Ascaris is feasible. This response can be largely subdivided into three phases. The first phase takes place during the hepatic-tracheal migration of the larvae. A short-lived immunological reaction against the migrating larvae is seen in the liver. Two weeks later, the immunological response changes from the liver to the lungs where the local lymph nodes are enlarged followed by the local production of antibodies. Due to these responses, approximately 50 % of the larvae do not complete the migration. Around day 17 post infection, after the surviving larvae have reached the small intestine, an intestinal hypersensitivity reaction is seen in the gut, resulting in the expulsion of more than 90 % of the worms. Finally, after a continued re-exposure to Ascaris eggs for several weeks, animals develop a strong intestinal immunity that prevents almost any of the incoming larvae to penetrate the intestinal wall. This is the so-called pre-hepatic barrier. Current research is focussed on the identification of the effector mechanisms that play a key role in the expulsion phase and the pre-hepatic barrier. The proteins presented at the parasite-host interface during the different phases of the life cycle are likely to play a critical role in the induction and development of the immune response. Such proteins can be present on the outermost layers of the cuticle and in the excretory-secretory products, which are mainly released from the cuticular surface and specialized excretory/secretory organs. To date, little is known about these components of A. suum. Limited by technical and practical constraints, earlier studies on A. suum ES and cuticle components were mainly focused on chemical composition, ultrastructure and recognition by antibodies from infected hosts. In this project, the aim is to characterize both the ES products and surface coat proteins of the different larval stages of A. suum using tandem mass-spectrometry followed by data interrogation against the recently completed A. suum genome. Furthermore, a large transcriptome dataset has been produced from the different larval stages, This dataset is currently being explored for transcriptional changes that appear in the parasites during their migration through the body of the infected host. 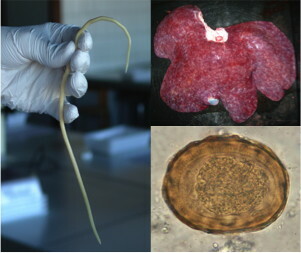 Ascaris suum is currently the only helminth that is still highly prevalent in intensive pig production systems, resulting in significant economic losses. In the pig industry, this parasitic disease is controlled by mass treatment of the pig herd with anthelmintics. However, due to the subclinical nature of the disease combined with the lack of appropriate diagnostic tools, ascariasis often remains undiagnosed, creating a lack of information regarding the worm-status of a farm. This makes it difficult to evaluate the currently applied deworming programs and the possible economical losses caused by the presence of this parasite on the farm. 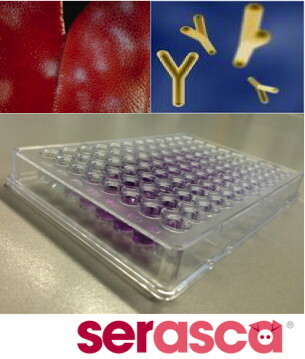 Our group has recently developed a new sero-diagnostic ELISA (SERASCA) that could provide information to the farmer and the veterinarian regarding the worm status of a pig herd. The relation between the ELISA results and pig performance parameters, such as feed conversion rates, condemned livers, daily weight gain, carcass quality and mortality is currently being investigated.